I have shared this invocation with several friends. St Philomena is a true wonder worker, she has helped myself and associates with life’s difficulties. 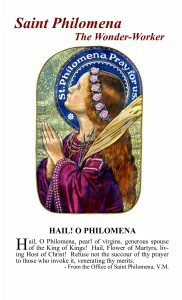 St. Philomena is very influential with our Lord. Bridget, please do not give up hope. I will be praying for you to Our Lord and His Mother Mary and also to St. Philomena. This has to be the most comprehensive, and the most traditional prayer book to Saint Philomena that I have ever come across. The collection of prayers addressed to this great saint is so beautiful, that having this book cannot but help one grow in love of this saint. The art work is beautiful; very many classical art, and some whimsical. Everything adds to the charm and value of this little volume. As a seminarian, I have asked Saint Philomena to see me through, especially at this difficult time and I know of her protection and help. Thank you Angelic Psalter for all your great work!